» Sign, Sign, Everywhere a Sign: The New LAX? Sign, Sign, Everywhere a Sign: The New LAX? Travelers using the Los Angeles International Airport could be confronted with a sea of digital, supergraphic and other outdoor ads for products like cars, movies, electronic devices and alcoholic beverages if a recently proposed airport sign district wins city approval. The total square footage of commercial advertising signs to be placed on terminal walls, wrapped around columns and attached to the faces of pedestrian bridges and parking structures would be the equivalent of 550 full-size billboards. An open house and public hearing on the proposed sign district is scheduled for next Tuesday, July 16. Click here for details. The fundamental purpose of the signage is to raise money for airport modernization, although airport officials haven’t made public any estimate of expected revenue. The current airport advertising contract is held by French billboard giant JCDecaux, but a contract for advertising on the new signage would be subject to a competitive process. These signs that would advertise products and services not available within the airport itself would all be contained within the terminal area and not visible from city streets or residences. In addition, the signs wouldn’t be permitted on the airport’s iconic Theme Building, the Traffic Control Control, and the Adminstration building. The proposed sign district includes a plan to remove a number of conventional billboards on airport property along Sepulveda Blvd. and elsewhere, although specific signs and dates on which they may be removed are not specified. 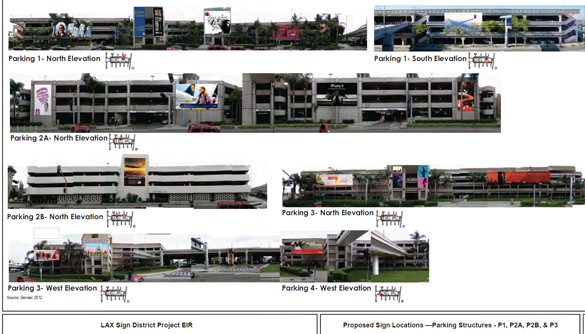 Large digital signs are proposed for the faces of parking structures in the center of the terminal area and the pedestrian bridges that cross between the structures and the terminals. Ads on the parking structure signs would be allowed to change every eight seconds, while those on the pedestrian bridges would be limited to one change every 12 hours. The environmental impact report (EIR) prepared for the project asserts that the digital signs won’t pose any hazard by distracting drivers of cars, buses, and other commercial vehicles on the highly congested roadway that loops through the terminal area. The signs will also be designed in such a way that light won’t affect air traffic, the EIR states. The EIR states that no study has ever shown a link between traffic accidents and digital signs, although a Swedish study released last year showed that drivers glances at digital signs were significantly longer than those at conventional signage. While the study didn’t link that finding to actual traffic accidents, the Swedish government ordered that digital billboards then on the country’s roads be removed. The EIR also categorizes the signage impact on energy use as “less than significant” because the estimated increase would only be 1.5%. That estimate was based on figures for digital signage power consumption provided by JCDecaux, although neither the actual figures nor the types of digital signage involved were specified. Before becoming reality, the sign district has to win approval from the City Planning Commission and the City Council.